Segmentation gives you more control over the email campaigns you send with Jilt by allowing you to define who gets your emails and why. By segmenting the audience, you can determine when and why certain customers are added to an email campaign based on their behavior (how they interact with your store). This makes your emails more relevant and effective, which means happier customers and more sales. 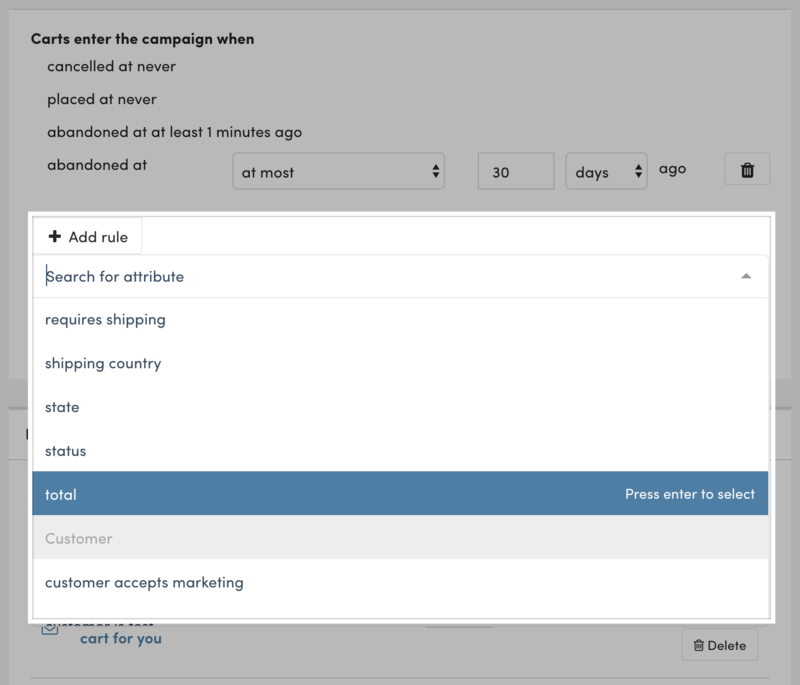 When you create a new campaign, you can choose when customers enter the campaign by adding a set of rules. By matching a customer's behavior to the rules you choose, these rules determine whether a customer is added to a given campaign. When a customer matches the set of chosen rules, they're added to the campaign, and the emails in that campaign are automatically scheduled (according to the timing you set for each individual email) and sent. There are two events to choose from currently: 1) cart abandoned, and 2) order completed — let's use cart abandoned as an example. Customers will automatically enter a campaign when their information matches the rules that you've set. So, in our cart abandoned example above, each time a customer abandons a cart on your store, they'll enter this campaign, so long as their cart isn't placed or cancelled (meaning they haven't actually placed their order yet), and they've abandoned their cart between 1 minute and 30 days ago. 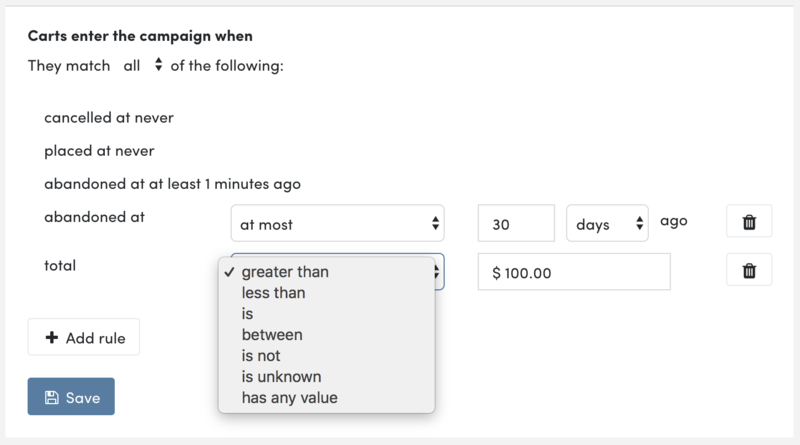 In this example, we've chosen the total attribute, entered $100.00, and selected "greater than", so this campaign only enters customers whose cart total is over $100. Attributes that are numbers, like cart/order total, can be filtered using greater than / less than / is (equal to). Other attributes are expressed as dates, like cart abandoned at, and will have different options for comparison, and are explained in more detail below. There are a few important things to keep in mind when segmenting your audience. First, once a customer has entered a campaign with a cart/order, they won't re-enter it unless they start a new order. This helps to avoid situations where a customer could receive duplicate emails about an order they've abandoned or placed. Second, a customer can't be in multiple cart abandoned campaigns at the same time. This is to avoid sending multiple emails about the same abandoned cart. Third, if the customer previously unsubscribed from emails or their email address is invalid, they can't enter a campaign. All campaigns have these default rules and they can't be changed. If you have a situation where you'd like to disable these rules, please get in touch with our support team. What attributes can I use to segment my audience? What else can I do with Segmentation? Segmentation is even more powerful when combined with dynamic content (using Liquid) in your emails. For example, you could create a campaign that sends a series of abandoned cart recovery emails to carts with certain products. Then, in each email, you could add a section that changes based upon the cart total.